Socks are required on all bouncers. Included with your paid admission to the Animal Farm. come visit Patches the Giraffe! We completely remodeled our primate exhibit and made it more interactive for your enjoyment. Walk inside the hallway of our barn and view our Marmosets, Lemurs and Squirrel Monkeys up closeand personal only inches away! Watch as they swing, climb and play on their own personal playground complete with radiant heated floors and large televisions for their entertainment. Coin operated feeding stations are available if you want to buy them a treat! eat special birdseed sticks right out of your hand. photo opportunity as well as great memories! 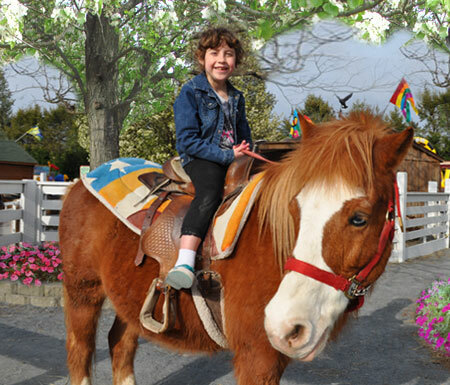 Pony rides are $5.00 + tax each and are available for purchase at the main entrance as well as near the Pony Ride Station. there is a weight limit of 65 lbs. per rider. Kids will love to take a ride on our Farmland Express Old Fashioned Train Ride. A mini-replica of the trains of yesterday that you can ride today! Long Island is right in your back yard! "The White Post Animal Farm"
You don't have to drive far to find the best animal farm petting zoo on Long Island. White Post Farms is centrally located right in Melville, NY and has been been a family farm since 1886! We have been voted the #1 petting zoo on Long Island by the readers of the Long Island Press. Our family friendly attraction has also been voted #1 among things to do with the kids by New York Magazine. We hope to see you all soon at White Post Farms of Melville, NY. With always free parking and our close central location on Long Island there's no need to travel far for a great day of family fun. Please click the "Become a Fan Button" below and like our all new Facebook Page! If you were a Fan of our old page you must still click the link to become a fan of our new page. Our old page is no longer in use.